My grandparents had them. They lined the den in their modest Indiana home. In the garage, outdated sets were stacked neatly in boxes. Every year, salesmen came to the doors of homes and schools peddling their wares. But all that is over. 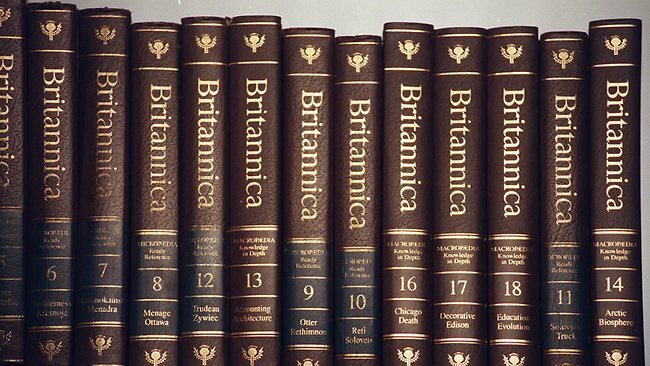 Encyclopedia Brittanica has announced that they will no longer offer their product in print. It’s rather a sad passage for some of us older folk. There aren’t many businesses that can claim they were viable for over two hundred years. In 1768, Encyclopedia Brittanica published its first set of volumes in Edinburgh, Scotland and has been in continuous publication until this year. It’s not difficult to understand what finally put the venerable company under. Two words: Wikipedia and Google. Publicly, the company claims that their online competition was not a deciding factor in killing their printed volumes but that seems difficult to believe. Not only is it much easier to access needed information quickly, it’s difficult to compete with “free.” A complete set of Encyclopedia Brittanicas runs some $1,395. Space, too, is a consideration. A full set consists of thirty-two volumes and weights upwards of 129 pounds. A good flashdrive, by contrast, could conceivably contain every entry in Wikipedia (26,603,553 pages) and fit comfortably in your pocket, with room to spare. While some champions of the old school encyclopedias decry Wikipedia for having factual errors, a study comparing errors in a sampling of Wikipedia and Encyclopedia Brittanica articles found that there were three errors in Brittanica entries and four in Wikipedia selections. And of course, factual errors are much easier to correct online than in print. Encyclopedia Brittanica prides itself on having experts write their entries. For example, Arnold Palmer penned the article about the Master’s tournament. If you truly care about this sort of thing, you can still have access to Encyclopedia Brittanica online. But it will cost you $70 for an annual subscription.